BOSTON, Mass. – Things were looking good for Foxboro after pitching a shutout in the third quarter, seizing control of its D2 State Semifinal against Arlington Catholic. Unfortunately, the offense couldn’t quite keep up with the outstanding defense. The Warriors kept Arlington Catholic without a point for a near 12 minute stretch — the final 3:50 of there first half, the entire eight minutes of the third quarter and the first couple of seconds of the fourth quarter. However, Foxboro went just 1/10 from the field in the final frame. Meanwhile, the Cougars’ offense finally came to life, scoring 18 points — eight from the charity stripe — and picked up a 37-30 win over the Warriors to advance to the D2 State Final on Saturday. Arlington Catholic surged to a 19-10 lead halfway through the second quarter but Foxboro’s defense — and offense — turned it up. The Warriors didn’t allow any points the rest of the half while rattling off a 7-0 run. To start that run, junior Ashley Sampson (13 points, 11 rebounds) drained a three to eclipse the 1,000 point mark for her career. Riley Collins (five points) added a basket and Grace Tamulionis (five points, six rebounds) converted a put back just before the buzzer to get the Warriors within two, 19-17, at the break. Foxboro kept the momentum up in the third quarter. 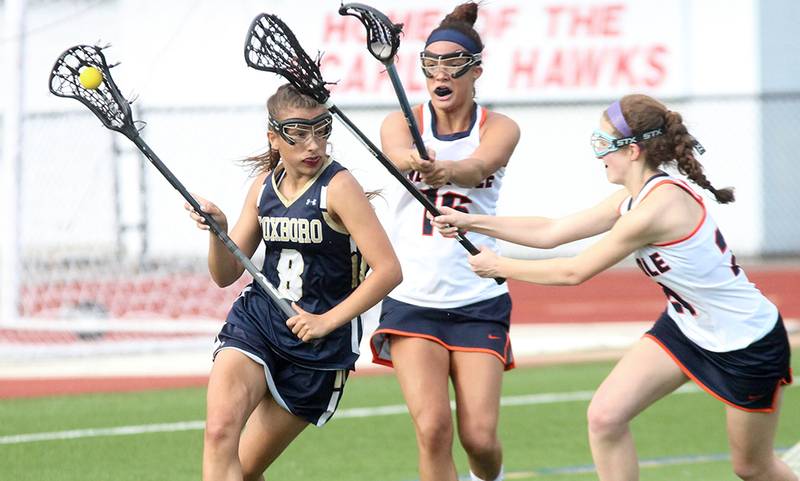 Lily Sykes gave the Warriors the lead with a three 90 seconds into the third quarter. Sykes added a free throw, Sampson hit three free throws and Collins drained a three in the final minute to give the Warriors a 26-19 lead through three. Arlington’s offense came to life in the fourth quarter, mainly by attacking the basket and getting to the line. Erin Donlan (13 points) broke the scoreless streak with a free throw eight seconds into the final frame. Donlan then added two more free throws and then hit a layup to cut the deficit to 26-24. Monica Rayo (eight points, five points) then tied the game with just under six minutes to play and hit another basket a minute later to give the Cougars a 28-26 lead, capping a 9-0 run. Foxboro’s offense finally broke into the scoring column in the fourth quarter, taking the lead back on a three from Tamulionis at 29-28. Lauren Flahive stretched the lead to two with a free throw with 2:31 to play, but that would be the last of Foxboro’s scoring. AC’s Lena Perez 11 points, 15 rebounds) tied the game off an inbounds play with just under two minutes to go. Foxboro came up empty on its offensive possession, and the Cougars’ Alexandra Bell (eight rebounds) his a turn-around jumper with 1:20 to play to give AC the lead back. Foxboro missed a shot and then had a turnover on the next possession, forcing the Warriors into foul mode. AC made five free throws in the final 44 seconds to seal the deal. Brady admitted the Cougars’ main defensive game plan focused on Sampson. 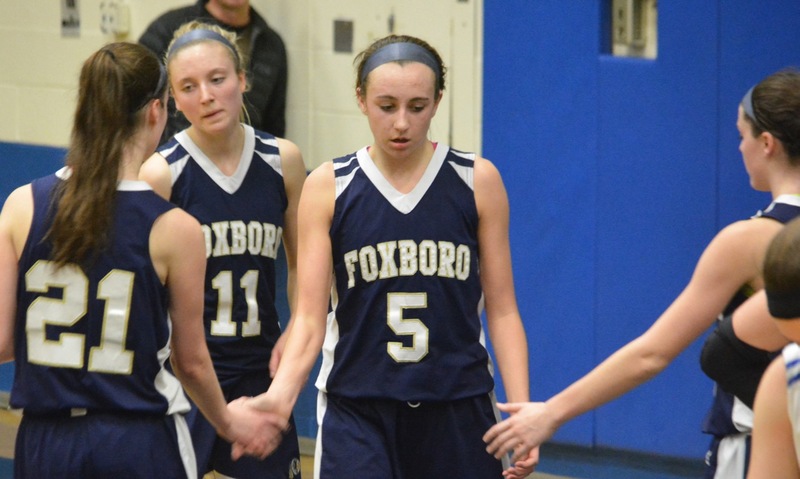 Foxboro girls basketball finishes the season at 22-3 and as Davenport division champions. BROCKTON, Mass. – Two years ago in the Div. 2 South final, freshmen Ashley Sampson and Grace Tamulionis combined for 20 points in a loss to eventual state champion Duxbury. On Saturday afternoon, Sampson, Tamulionis, and the Warriors returned to Brockton High and used that experience to good effect to rally Foxboro in the fourth quarter. Sampson scored eight of her game-high 19 points in the final quarter (and added 10 rebounds as well) and Tamulionis scored six of her 11 points in the fourth to bring Foxboro back from a point down to beat Westwood 47-38 and claim the program’s first sectional title since 2003 and book a trip to the TD Garden. The Wolverines did not look overwhelmed by the environment early and came out strong in the first quarter with senior forward Carly Sugrue knocking down a pair of threes and scoring eight of her 13 points. Haley Connaughton also hit one from deep and Allison Morin had three assists, as the Westwood offense was clicking at the start. Sampson was keeping the Warriors afloat on the offensive end with eight points in the first, all coming off drives to the basket. 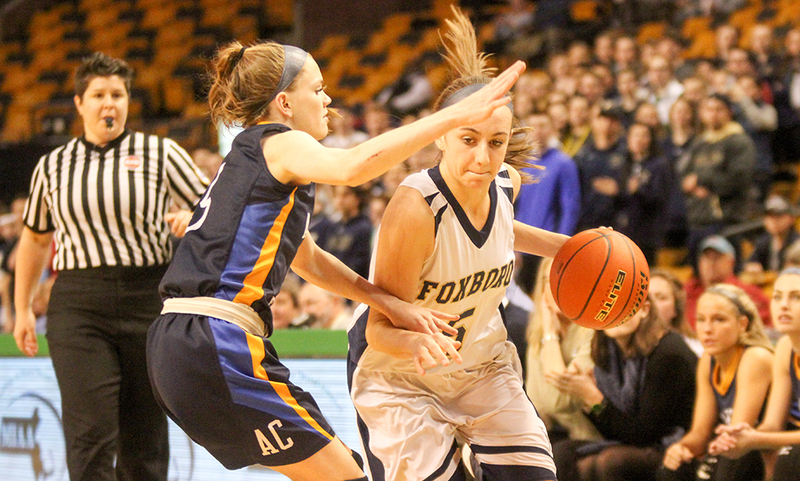 Foxboro’s aggressiveness driving to the basket led to seven Westwood fouls in the opening quarter. Junior Shannon Smally (six rebounds) also provided a spark with three points and a couple boards in the first. Foxboro trailed 17-14 after one and would continue to struggle shooting from the outside for the better part of the next two quarters. The Warriors stayed in the game in large part due to a defensive effort that held the Wolverines to only 21 points over the final 24 minutes. With Westwood leading 24-19, Foxboro inbounded the ball to Lily Sykes for a half-court heave as the half expired. The horn sounded and the shot fell short, but an official’s whistle blew just before the clock read all zeroes and Sykes made 2-of-3 free throws to cut the lead to just three. In the second half, Downs made a change and put Sampson on Sugrue, a switch that limited the Westwood forward to just two points after the break. Foxboro finally found the range from three. Sykes (seven points) buried her only shot of the game to cut the lead to 26-24. After a Westwood basket, Sykes drove baseline and kicked it all the way out to the three-point line for Riley Collins to knock one down and tie the game. The Wolverines responded with four straight but then again Collins got a clean look and hit from three sending Foxboro into the fourth down just 32-31. Catherine Bonfiglio (team-high 14 points) started the fourth with a drive to the basket to extend the lead to three, but her six points accounted for all of Westwood’s points in the fourth. After a ragged start in which both teams missed a lot of open looks, Foxboro clamped down and contested every Westwood chance. On the other end, Sampson, the Hockomock League MVP, started to assert herself. She drove baseline and finished with a reverse layup plus the foul and then knocked down a jumper off a Sykes assist to give Foxboro its first lead (36-34) since the first quarter. Tamulionis stepped up next, knocking down a long jumper off a Smally kick out to extend the lead to four and then stepped a couple feet further back to drain an open three that made it 41-36 with 1:05 remaining. Foxboro went 6-of-8 at the line in the closing minute to complete its run as the top seed in the South by lifting the sectional championship trophy. “I knew we had it in us,” Downs said, “and I never panicked too much because I could see it in their eyes that they had this game within their grasp and it was theirs to win or lose. Defense was going to win it for us. Foxboro (22-2) advances to the Eastern Mass. final at the TD Garden on Monday at 5:45 to play the winner of Arlington Catholic and Hamilton-Wenham. FOXBORO, Mass. – Coming off a difficult opening round game against No. 16 seed Scituate, top seeded Foxboro wanted to send a message right from the start in Saturday afternoon’s Div. 2 South quarterfinal against 2016 sectional runner-up Hingham. The Warriors came out firing on all cylinders, started 7-for-9 from the field, with six assists on those seven baskets, and scored 21 points in the opening quarter against the Harborwomen, nearly half of what they scored in the entire first round game. Thanks to the strong start, Foxboro never trailed at any point against Hingham. In fact, the Harborwomen never got closer than nine points (midway through the second quarter) and Foxboro eased into the semifinal with a 62-39 victory. Senior guard Kristen Bortolotti was injured prior to the beginning of the playoffs and in her absence, junior forward Shannon Smally was given a spot in the starting lineup. She made it count scoring six of her 10 points in the first and providing a spark in the post on both ends of the floor. Lily Sykes drilled a pair of threes in the first and Grace Tamulionis knocked down a baseline jumper and a three to help Foxboro extend the lead out to 10 points, 21-11, by the end of the quarter. Defensively, the Warriors also made a switch from their typical man-to-man to a 2-3 zone to try and limit Hingham’s ability to get into the paint. 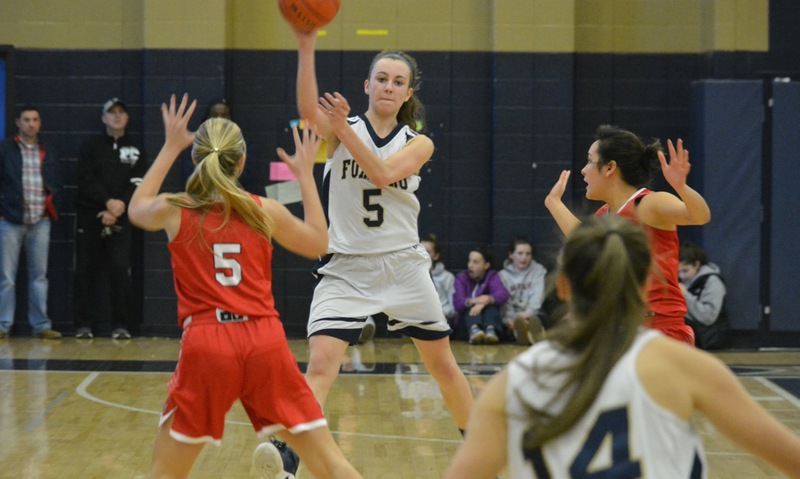 The second quarter was very different for Foxboro, which only scored six points and made two shots from the floor, but the defense, whether in man or zone, clamped down and held Hingham to only one basket and three points. Senior Lauren Flahive was an important cog in that defense with four first half steals, as well as six rebounds and two assists. The Warriors led by 13 at the break and never allowed Hingham to get any closer, although there was still some trepidation that the Harborwomen could go on a run. Ashley Sampson, who was named Hockomock MVP by the league coaches, had picked up a third foul (in what appeared to be a case of mistaken identity) and sat for a few minutes but Downs decided to bring her back with about three minutes left in the third and a 13-point lead. The move paid off. Sampson, who had only scored six points up to that point, buried a step-back three and then drove to the basket to close out the third quarter with Foxboro ahead by 17, 38-21. In the fourth, Sampson took over. She scored 13 of her game-high 24 points, shooting 9-of-10 from the free throw line, as Hingham tried to extend the game with fouls. Tamulionis also came through in the fourth with five of her 12 points and Riley Collins nailed a corner three to add some separation in the final minute. Although Hingham was never really that close in the second half, Downs admitted that it was only in the final couple of minutes that she started to feel like the game was in control. As the Warriors move forward in the tournament, they will miss not having Bortolotti in the lineup but Downs is confident that the other players can pick up the slack on both ends of the floor. Foxboro (20-2) will face No. 4 North Attleboro in the Div. 2 South semifinal at Massasoit Community College on Monday night at 5:30. The teams split two meetings in the regular season. FOXBORO, Mass. 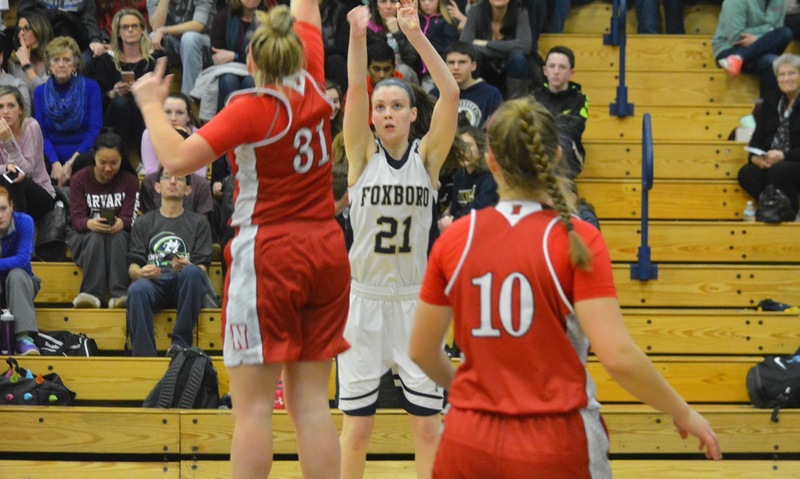 – For the past month, Foxboro and North Attleboro have been taking care of business on the court with half an eye on each other’s results. Since the two teams last met on Jan. 20, North went 5-2 (despite missing senior guard Ashley Ahern for all seven games) including a five-game win streak entering Friday night. Meanwhile, Foxboro rattled off nine straight wins, eight off those coming in the league. Click here for a photo gallery from this game.Grace Tamulionis scored 11 points, knocking down a trio of three-pointers, and all four of her shots were assisted by Lily Sykes (seven assists). Kristen Bortolotti also got off to a strong start with six of her 12 points in the first. The lead stretched to as many as 18 in the second quarter, after a Lauren Flahive (six points) jumper, but North started to find the range on offense and slow down the Warriors. Samantha Taggart scored seven of her team-high 12 in the second and assisted on a Caroline Collard (seven points, seven rebounds) jumper that cut the lead to 28-21. It was as close as the Rocketeers would get for the rest of the night. Hailey Maling drove and kicked out to Riley Collins for a three that regained a double digit lead for the hosts at the break. Foxboro came out of halftime intent on putting the game away and that is what the Warriors did, using an 11-0 run to extend the lead to 21 points (46-25). Ashley Sampson (game-high 19 points) was the aggressor for the Warriors, scoring seven in the third including a corner three off a Sykes assist and then going coast-to-coast for a layup off a steal. Bortolotti and Tamulionis (18 points) each added four in the quarter. “In the second quarter we were able to score and defend a little better and keep them disrupted. In the third quarter, we just couldn’t sustain it offensively,” said Herber, whose team trailed 50-32 entering the fourth. On Monday night against Bridgewater-Raynham, Foxboro had only four players get on the score sheet, but on Friday eight Warriors scored at least two points. That balance made it difficult for North to send help for Emily Schromm on Sampson and the senior got into foul trouble in the third quarter. In the end, Schromm and Collard would both foul out. Foxboro also had a decisive edge on the glass, despite North’s advantage in height. The Warriors were plus-10 on the boards, which Downs credited to a total team effort. 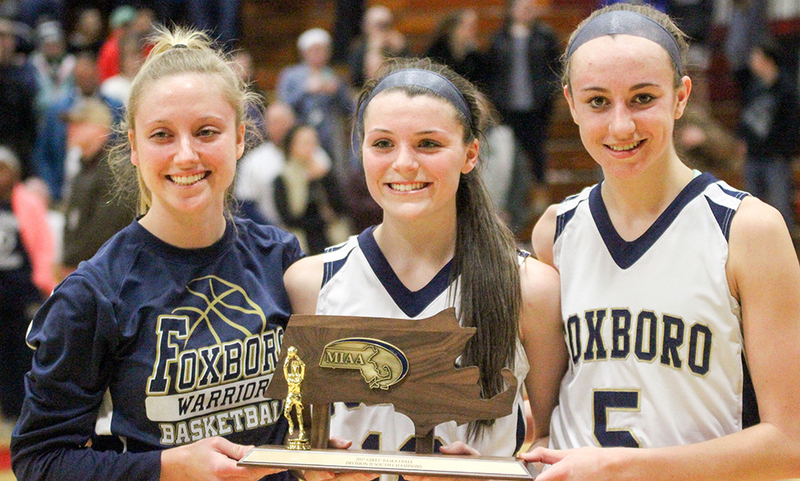 Julia Feid scored a traditional three-point play to cut the lead to 19 in the fourth, but Foxboro responded to seal the win and the title. Sampson hit a pair of free throws (two of her six points in the fourth and 13 in the second half) and then assisted on a Maling jumper. Maling then provided her second assist of the game on a kick-out to Tamulionis for a dagger three. After clinching its eighth league title and second in the past three seasons, Foxboro (16-2, 14-2) will try to sew up the top seed in Div. 2 South in its end-of-season Warrior Classic beginning with Whitman-Hanson on Monday. North Attleboro (15-5, 13-3) will also try to work on its seeding for Div. 2 South and get revenge for an earlier loss when it travels to Attleboro. FOXBORO, Mass. – Despite school being canceled in Foxboro due to a storm that never materialized, the Warriors began a very important week by hosting a non-league game with Bridgewater-Raynham, a team that they beat by nearly 30 points the first time around. Monday’s second meeting was considerably closer. 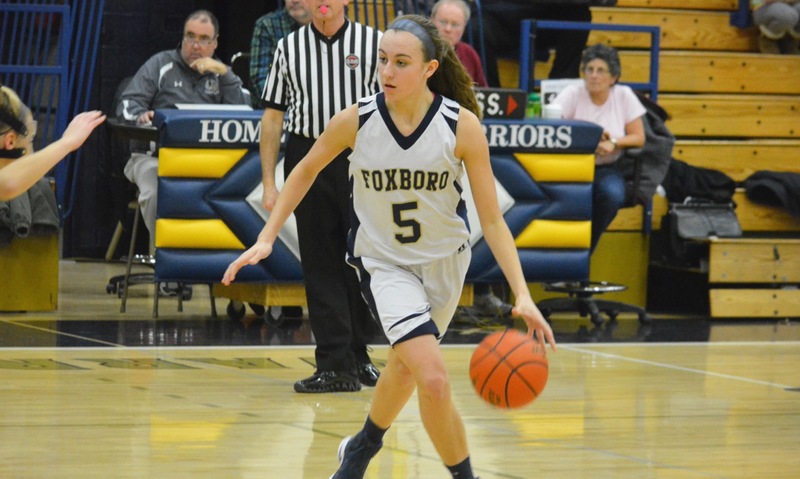 Foxboro had only four players get on the score sheet (and one of those players had a single point), but one of those four was junior guard Ashley Sampson and she scored a game-high 31 to lead the Warriors to a 56-44 win, their eighth in a row, and a sweep of the Trojans. It also kicked off a busy week that could end with Foxboro clinching its second league title in three seasons. At the beginning of the game, the Warriors looked like a team that was still enjoying a restful snow day and B-R was able to jump out to a 12-7 lead behind 10 first quarter points from senior Kelly Page (team-high 19). Foxboro woke up and found a groove to close out the first half on a 19-4 run to take control of the game. Grace Tamulionis (nine points, six rebounds, five steals, and three blocks) got things started with a jumper in the lane from a Kristen Bortlotti assist. Sampson scored in transition to cut the lead to one and, after the Trojans scored on an offensive rebound, Lily Sykes drove to the basket for two of her 15. Sampson ended the first with free throws to give the hosts a 15-14 lead and Foxboro clamped down in the second quarter, allowing only two points to go ahead by double digits at halftime. Sykes and Sampson each scored four and Tamulionis drilled a straightaway three off a Lauren Flahive assist to make it 26-16 at the break. B-R started to find its offense in the third quarter and cut the lead to as few as three points at 34-31. Page added another five points and Nina Morrison had seven of her nine in the third, as the Trojans took control of the glass and had Foxboro on its heels. Needing a spark, Foxboro turned to Sampson and the junior delivered. She went on a personal 9-2 run and the Warriors regained a double digit lead. She scored on the break and then, after Sykes had one of her eight steals, Sampson added another layup plus the foul. Another Sykes steal led to another easy basket and Sampson capped the quarter with a reverse for a 43-33 lead. Again B-R tried to cut into the lead in the fourth, but a Sampson three-point play made the lead nine points, then Sykes scored on a drive to the basket, and Tamulionis got an open look for three off an assist by Flahive (seven rebounds, four assists, two blocks), who also fed Sampson for a layup that put Foxboro up by 14. Foxboro (14-2, 12-2) will get back into league play with Canton on Tuesday night then a showdown with fellow league leader North Attleboro on Friday in a game that will decide the winner of the Davenport division.